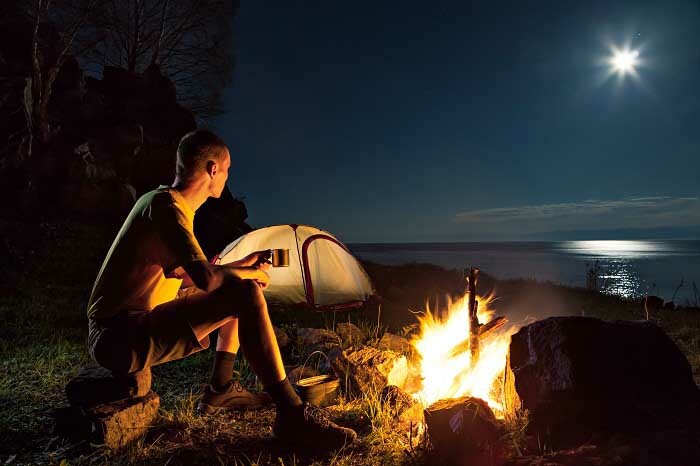 Camping is a simple yet fantastic way to escape from our busy daily lives to explore the nature. Unlike trekking or thru-hiking, camping requires less preparation, but it doesn’t mean that a camping trip is only about securing a spot and setting up a tent. For a successful camping trip, you will need to find answers to lots of questions. When is the best time to go, or what is the best tent for camping, or what are the best hiking sandals for my camping trip and so on? If you have never taken a camping trip before in your life, it is easy to be confused and discouraged by all these questions. But with our ultimate guide to camping for beginners below, you will be able to overcome your hesitance and confidently plan for your very first camping trip at ease. Why Should We Go Camping? There are many ways for us to go explore the outdoors, from trekking to backpacking or hiking and camping. 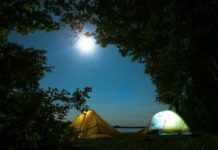 All of them are interconnected to each other, for instance, a camping trip usually involves hiking while a trekking trip normally involves occasional camping. But camping remains a popular activity that works for everyone. You don’t have to be a hiking expert to go camping. So, is camping worth trying? Should we or should we not do it? The answer, in short, is yes. After all, camping promises us plenty of benefits and rewarding experiences that you won’t find elsewhere. For a person who has never camped out before, we can see how he or she may feel reluctant about the whole camping thing. One may be afraid of stepping out of their comfort zones, or worried about bugs, wild animals (mountain lions...), or even getting lost, while some are turned off by the idea of sleeping on the ground. All of the concerns above are valid, however, with proper planning and preparations, these issues can easily be avoided. Thus, you should not let these concerns hold you back from trying out camping, otherwise, you will be missing out on a great deal of benefits that camping brings. Let’s see what they are. The great thing about camping is how it creates a bond among people who camp together. Through camping, family members will be able to interact and have fun together, which can be a luxury for those with a crazy work schedule. Couples can share wonderful intimate moments through romantic camping as an alternative to going to the movies or watching TV. 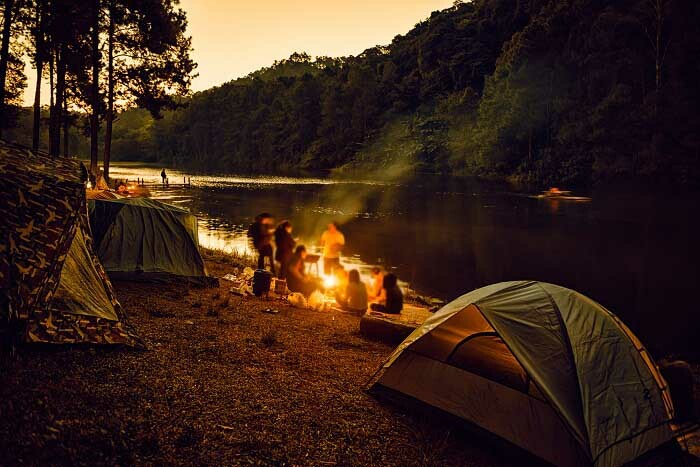 Camping is an amazing way to meet and get to know new people. Together we can spend time cooking and sharing foods, making conversations, singing and dancing instead of looking at our phones all the time. If you are looking for some quality time to be alone searching for life meanings or to escape from the bustling city and the civilization, then camping is right for you. What can be better than contemplating on the meaning of life up in a mountain where you can have a great view of the ocean? No more deadlines, no more work or exam pressure, just you and yourself. Total peace! The good thing about camping is it brings you closer to nature where you can learn more about the world around you, particularly the wildlife. The air is fresh, the scenery is extraordinary and at nights, stars are shining upon your head. Perfection! This is especially true for a first-timer. Once you manage to successfully complete your first camping trip, you will develop a sense of accomplishment and become prouder of yourself. Camping will not only provide you with an opportunity to challenge yourself and your assumptions, it will also broaden your mind and keep you physically and mentally fit. Are you excited about going camping yet? If yes, let us walk you through essential camping tips below, including a comprehensive camping for beginners checklist. Camping for the first time can be a daunting task. You will need to choose your campsite, getting your hands on essential camping gears, going through the camping checklist and probably doing some practice. But before you get to know the tips on planning and preparing for first-time camping, it is wise to get a glimpse into different types of camping first. You may be surprised to learn that there’s more than just one type of camping. When people think about camping, they invariably associate camping with tent setup and campfire, which is only one part of a larger picture. 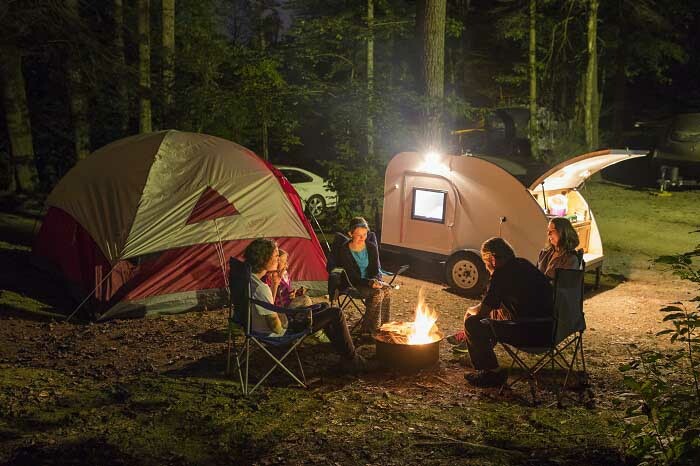 Whether you are planning an overnight trip outdoors, a weekend getaway or just a day trip, you can look at the following popular types of camping to make appropriate arrangements. - Adventure camping: This is the type of camping which focuses mostly on adventures, such as competing in a race or mountain biking. Camping happens at night in a basic and minimalist manner. - Dry camping: In short, dry camping refers to camping in a location with no access to natural water, e.g. a desert. If you worry about the risk of flash flood, then dry camping is an awesome option. Please note that dry campers must prepare their water carefully in advance. - Backpacking: Backpacking allows you to live deep in the wilderness and is suitable for the experienced traveler. There’s also ultra light backpacking, in which backpackers bring as few camping gears and items as possible. Whatever it is, backpacking requires much more strength and efforts than an overnight camping trip. - Vehicle camping: Vehicle camping refers to the involvement of a certain type of vehicles on your camping trip. It can be a bicycle, a car, a canoe or an RV. Some people prefer to bring their vehicles along for more mobility, but at the same time, it results in bulkier luggage and extra weight. 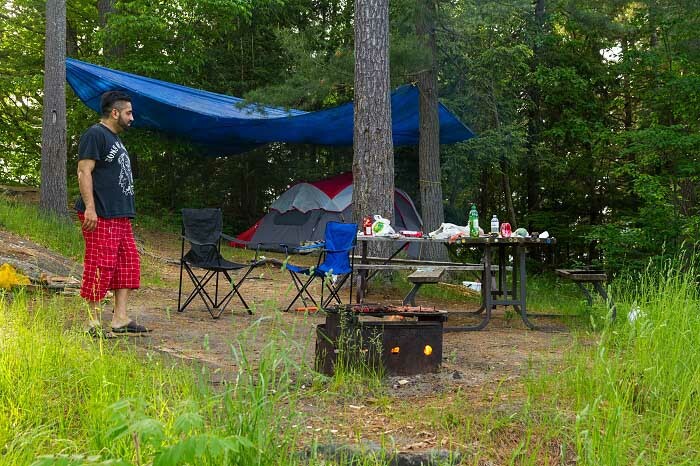 Once you have learned about different types of camping, it’s time to determine your campsite. There are plenty of campsites available for you to choose from. If you intend to camp out with your family and pets, look for places that are child and pet-friendly. For a newbie to camping, you are recommended to book a campsite with existing facilities and a town nearby. That way you can reach for supplies or foods in case you forget something. Here comes the important part. An inexperienced camper often has a hard time deciding which one to bring. A camping trip can turn into a disaster without proper camping gears, so it’s best to prepare a checklist of essential items. 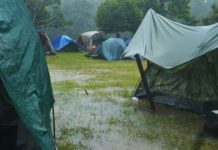 When you go outdoors, you should be prepared for even the most unexpected situations, such as camping in the rain. Your items should be sufficient to keep you ready for such events. To ensure you have smooth camping experiences, we have prepared a camping for beginners checklist for you. Many people assume that tents are the most important camping gear that every camper needs, but it’s only partly true. For those who intend to go hammock camping, for example, getting exceptionally good hammock matters more. You can refer to our checklist and make adjustments where necessary to fit your needs and preferences. This may sound weird but for a first-timer, it is wise to do some practice to familiarize yourself with the process. After you purchase necessary items for your upcoming camping trip, you can give them a try. For instance, you can try pitching a tent at home. It’s not difficult to set a tent up and take it down, but it can be quite tricky for first-timers. Also, you can try and test other camping gears such as lanterns to ensure that they are in the best working conditions. Practice will give you more confidence in your camping trip. You can even try camping in your garden if possible to see how it feels. Apart from preparing all of the essential camping gears, do not forget to plan your meals in advance. It’s best to plan ahead what you are going to eat and how you plan to cook at the campsite. You can also do a quick research on the area for potential restaurants or stores to have some backup options for foods. With the aforementioned tips in mind, you are very close to becoming a professional camper. It’s time to do some shopping for essential camping items. 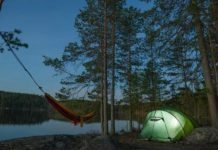 Not all camping trips will require all of the camping gears below, but for a beginner, it is needed to include these items on the checklist. Once you become more experienced, you can adapt the list and choose your camping gears accordingly. The first and foremost item is none other than the camping tent. There are a wide variety of camping tents out there, and to choose the right tent for you, you need to consider lots of factors. Firstly, look at the tent sleeping capacity and group size. A pop-up tent is highly portable and perfect for one person while a 6 person tent or 10 person tent is also available to accommodate a large group of campers. Apart from the capacity, you should also consider the weather conditions to select the best camping tent. Some tents are made to endure really harsh conditions. Some other tents include numerous key features such as a tent vestibule, which is a plus for those who wish to keep their belonging intact. You can also ask for advice from experienced campers. Like the camping tent, a good sleeping bag can make a big difference to the success of your camping trip. Usually, a sleeping bag is made for one person, but you can opt for a double sleeping bag for either extra space if you travel alone or for more warmth and comfort if you travel with your partner. To choose the best sleeping bag for your need, take a good look at its shape, its insulation type, and its temperature rating. Some people consider a sleeping pad an optional item for camping, however, a good sleeping pad can increase the quality of your sleep and add to your comfort during your camping trip. A tent footprint acts as a ground cloth placed beneath a tent while a tarp can act as both a tent footprint and as a roof or a heat reflector for your tent. They are both very useful in camping and depending on your intended use; you may consider bringing either one. A tent footprint works best in situations where the ground is too rough or when you go camping by the beach. In other cases, you may want to consider the tent tarp due to its multi-functions. A lantern can come especially handy when you want to bring some light into your tent when the night falls. There are three types of lanterns namely electric lanterns, fuel-burning lanterns and candle lanterns that cater to different need and preferences. There are special stoves and lighters produced specifically for camping purposes. You can use the stove and lighter to cook meals, boil water or set up a campfire. Make sure to check the rules of the campsite to see if campfires are allowed or not. A cooler is not a must-have item for every camping trip, but it can be a game-changing item under hot weather. If you plan to camp by the beach during summer, we highly recommend you to bring a nice cooler. Though there are many brands to choose from, a cooler made by YETI remains a popular choice among campers. Apart from a nice sleeping bag, a camping chair allows you to relax and enjoy every camping moment. Most camping chairs are portable and foldable, so do not hesitate to bring one with you on your next camping trip. Don’t forget to test the chair before buying to check the level of comfort. These are all very small items but are highly necessary to ensure a nice camping experience. These items can be purchased in sets or separately, with various forms and designs to choose from, such as collapsible camping dinnerware made from silicone, or a beautiful coffee mug made from stainless steel. In our current world where technology is domineering many parts of our lives, camping provides us with an opportunity to escape from the chaos of the city to get in touch with our nature. While it can be a bit troublesome at first to prepare yourself for the first camping trip in your life, from finding the best-camping tent to the best hiking sandals, we can assure you that camping is definitely worth your preparation efforts. Give it a try and you won’t regret it! Cool post! I’m yet to go on a camping trip. I think I’m going to refer to this post whenever I decide to go.